CWG 2018 Wrestling came to an end and India added four more medals including two gold and two bronze to top tally. CWG 2018 India Wrestling: Indian wrestlers finished their campaign in CWG 2018 with two gold and two bronze medals on Saturday. Vinesh Phogat and Sumit Malik won the gold medals in the women’s 50kg and men’s 125kg while Sakshi Malik won the bronze medal in women’s 62kg. The other bronze medallist was Somveer who won the medal in 86kg. India won a medal in each category and finished at the top of the medals tally in wrestling. With five gold, three silver and four bronze, India took the first place amongst Commonwealth Games nations. VINESH PHOGAT WINS GOLD IN WOMEN'S 50KG FREESTYLE! She started slowly on the day but grew in confidence as the matches went on. A brutal showing in the final to down Jessica Macdonald. Turns around her heartbreak from Rio Olympics where she was stretchered off. Smart start from Jessica Macdonald to keep Vinesh at bay in the first part of the second period. But Vinesh comes back strongly as the clock ticks down to extend her lead beyond ten points. Wins 13-3 in the end. SUMIT WINS GOLD MEDAL IN 125kg FREESTYLE! Another walkover for Sumit in the competition as Sinivie Boltic was injured earlier. Comes on for the formalities and the referee lifts his arm. Sumit goes on to fly the flag over his shoulders and takes in the applause. SAKSHI MALIK WINS BRONZE MEDAL! Sakshi with a tough 6-5 win over Tayla Ford of New Zealand. Not the most pleasing of performances from her at the CWG. She won't be best pleased with CWG more of a breeze for most Indian wrestlers. Lovely start for Sakshi Malik in the second period. 30 seconds in and she starts with a takedown of Ford. Leads 4-2. Another takedown with under 90 seconds to go and that's two more points for Sakshi. Leads by 6-2 now. Ford reduces the gap to three as she goes on the attack by catching Sakshi's leg. But what beautiful defending from Ford to overturn Sakshi's advantage to make it 6-5. With under ten seconds to go, Ford goes on the attack and Sakshi desperately holds on to win 6-5 in the end. In the medal matches set for later in the day, Somveer will contest for the bronze medal against Alexander Moore. Sakshi Malik, Sumit and Vinesh Phogat will continue in the Nordic events. Sumit downs Tayab Raza of Pakistan in the gold medal match in 125kg. What an epic contest which had Sumit leading early before Raza came back to reduce the deficit at 3-2. It was all Sumit after that as he displayed incredible athleticism even as Raza went for it all. Once going across the length of the zone on one leg, hopping as he did, to avoid stepping outside the bounds. He wins 10-4 in the end and WINS THE GOLD MEDAL! What a comeback from Sumit! What an incredible comeback from Sumit to win this bout against Korey Jarvis of Canada. Incredible stuff from the Indian to overturn a 0-2 points deficit. Turned it around to make it 3-2 before it became 3-3 with clock ticking down. But Sumit once again flipped Jarvis in final five seconds to win 6-4. What a win for Sumit that. 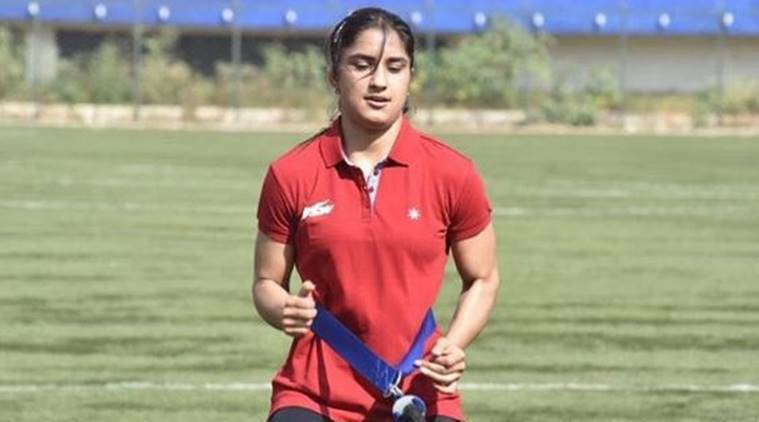 Vinesh Phogat defeats Rupinder Kaur of Australia in the 50kg freestyle to enter final. Sakshi Malik leading Fazzari 8-6 with a minute to go. Fazzari is mounting a big comeback here. She has tied it 8-8 with Sakshi holding criteria. Can she hold on?! Somveer Kadian will take on Taebontangaroa Kookoo of Kiribati in the men's 86kg freestyle. He is wrestling at his first ever Commonwealth Games. Here we go! So far, India have won eight medals in wrestling at the Commonwealth Games 2018 in Gold Coast. On the first day, Rahul Aware and Sushil Kumar brought home gold medals while Babita Phogat won a silver medal. Kiran won a bronze medal on day one. On day two of the competition, India won one gold, two silver medals and one bronze medal. Bajrang Punia was the only gold medallist from India. The two silver medallist from India were Pooja Dhanda and Mausam Khatri after they had contrasting loss in the finals. Divya Kakran was the sole bronze medallist. Four more wrestlers go to action on the penultimate day. Sakshi Malik and Vinesh Malik will compete in women's freestyle while Somveer and Sumit will compete in the men's freestyle.